An Englishman named Chris Kutler has been hunting with a metal detector for over 25 years and just made the biggest discovery of his life. He spent 4 days systematically scanning a 5,200 sq foot field in Chelmsford, Essex (~1.5 hours northeast of London) because he read an article suggesting there may be remains of treasure there. Chris had actually been there 18 years before when he found other rare Anglo-Saxon coins at that are now housed at the British Museum. According to law, a treasure is considered “two or more coins from the same find, at least 300 years old, and contains at least 10% gold.” So, technically, Kutler found a “hoard” of ancient coins. These specific coins are called “Tremissis” meaning “a third of a unit,” which measured 1.5 grams. It turns out the belonged to the Merovingians, a Salian Frankish dynasty that ruled the Franks for nearly 300 years in what is today’s France starting from the mid 5th century. 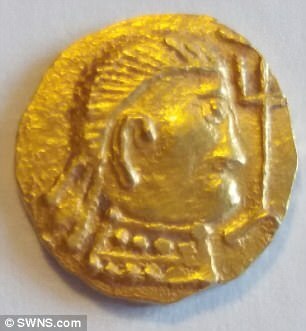 Researchers believe these newfound gold coins were buried with an Anglo-Saxon King about 1,500 years ago. That would mean they’re from the Dark Ages of 620-640AD. These kinds of coins are usually found buried with high-class people or even royalty. “It is kind of the Holy Grail of metal detecting. It was an incredible feeling to find the coins. 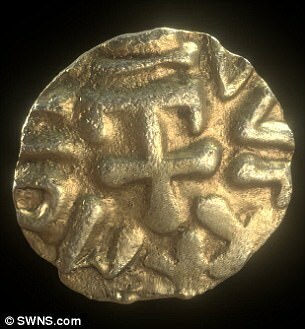 The official value of these Anglo Saxon gold coins will be appraised by the British Museum but may take up to a year for a complete analysis. Let’s hope they don’t go missing and forgotten like artifacts in the Smithsonian.